July | 2013 | Mommy. Foodie. Athlete. I love barbecue sauce and I love honey mustard. Both are awesome on pork, but they don’t quite fit into the low calorie diet. I solved that dilemma by whipping up this marinade which was a combination of both flavors and it was delicious! 1. 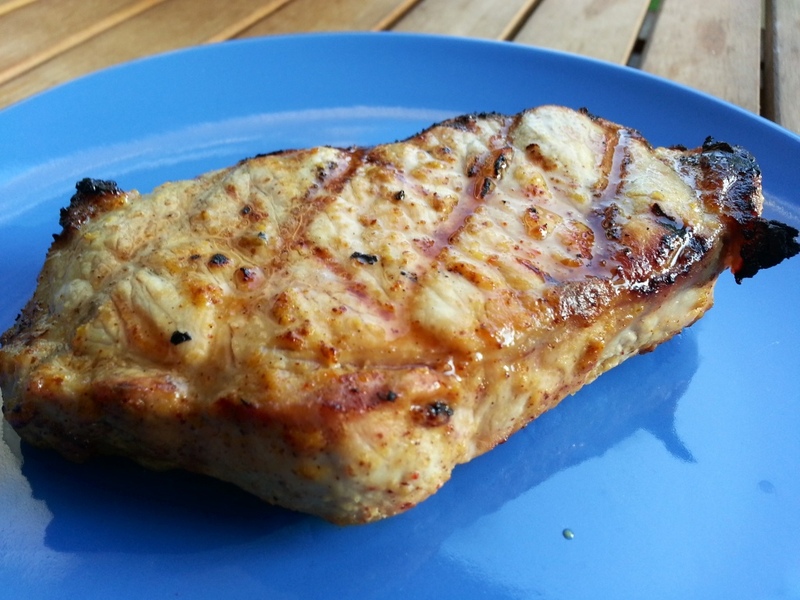 Place pork chops in a ziplock bag. Mix together remaining ingredients in a small bowl and pour over pork. Seal and refrigerate for at least one hour. 2. Preheat grill to medium high heat. 3. Grill chops for 5 minutes per side and serve with a pile of veggies or slaw. Growing up in an house with a Portuguese mother and and Italian father meant that broccoli rabe was a staple at the dinner table. It can be a strong flavor, but certainly a delicious one! If broccoli rabe isn’t your thing, try substituting spinach! 1. At least an hour before, marinate chicken with 1 clove garlic minced, 1 Tbsp. olive oil, lemon juice, salt, and pepper in a ziplock bag. 2. When ready to cook, preheat grill to medium heat. 3. Wash and chop broccoli rabe. In a large pot, sauté 1 clove of minced garlic in 1 Tbsp. of olive oil until fragrant. Add broccoli rabe, red pepper flakes, and salt and pepper to taste. Allow to sauté for about 3 mi uses until wilted. 4. Slice pockets into the chicken breast carefully. Stuff each pocket with broccoli rabe and secure opening with a toothpick. 5. Grill for 10 minutes per side. While chicken is grilling, make a small tomato salad by dicing a ripe tomato and tossing with balsamic vinegar, salt, and pepper. 6. 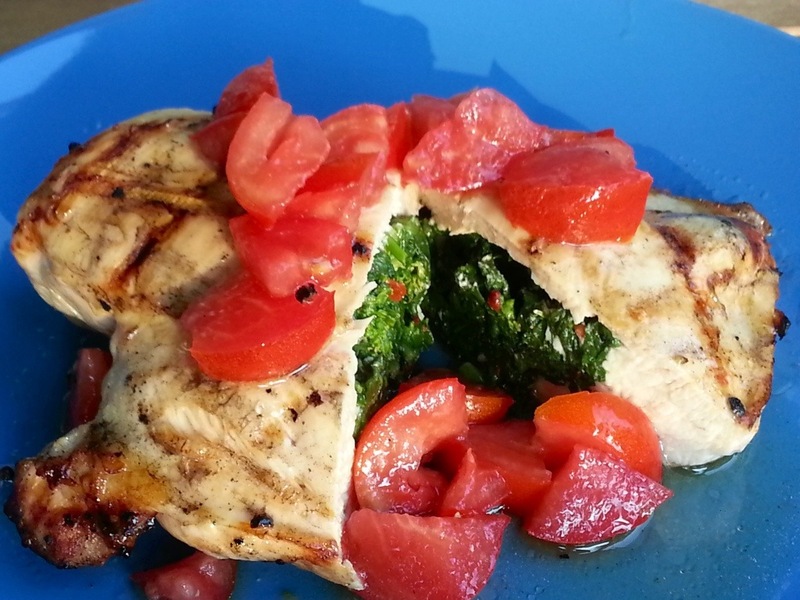 When the chicken is grilled, plate with a pile of tomatoes and enjoy! I am a Daddy’s girl, and a day out on his boat with him makes me a happy camper! I have been consumed by wedding planning details (8 days, eek), and a day out on the water was just what I needed! We only caught one fish (ok, HE caught the only fish), but that is dinner for tonight! Can’t get fresher than that! I am using fluke for this recipe, but if you can’t find it, any filet of white fish would work. You could use flounder, tilapia, or sole. 2. In a food processor, chop the walnuts until they form chunky crumbs. Transfer to a plate. 3. Rinse out food processor, add sundried tomatoes, basil, garlic, olive oil, and salt and pepper. Blend until it forms a paste. 4. Coat each filet with sundried tomato paste then coat with walnuts. Place on baking sheet. 5. Bake for 12-15 minutes until walnuts begin to brown. 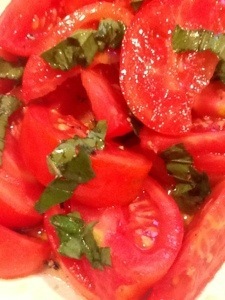 Serve with a fresh tomato salad from the garden! Mmmmmmm, Mexican food! It doesn’t have to be dripping in fat and calories. Skip the cheese, sour cream, and tortillas and enjoy this intensely flavorful dish without the guilt! Have non-paleo members in your home? Serve over rice for them with the dairy goodness on the side. 1. Cut chicken, peppers, and onions into 1 inch pieces and transfer to a large mixing bowl. 2. In a small bowl, blend remaining ingredients and toss with the chicken mixture. Transfer to a ziplock bag and refrigerate for at least one hour. 3. Soak bamboo skewers in water and preheat grill to medium high. 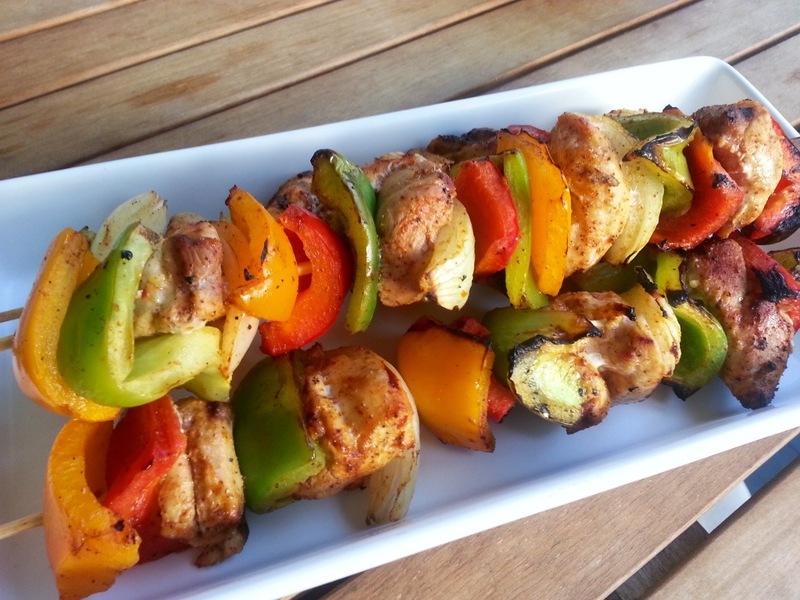 Skewer alternating pieces of chicken, peppers, and onions. 4. Grill for 12-15 minutes until done while rotating frequently. I made a scrumptious eggplant caponata today and I needed a way to turn it into dinner. The workouts have gotten harder (ok, I just haven’t given myself a break for days on end. 11 to be exact.) and my body could use the protein. Marinated chicken breast provides the perfect medium for shoving this delicious caponata in your face! No time to make our own? Most grocery stores carry a couple varieties in the ethnic aisle. 1. At least an hour before cooking, whisk together vinegar, olive oil, garlic, and red pepper flakes. Pout into a ziplock bag, add chicken, and refrigerate. 2. Preheat grill to medium high and grill chicken until done (about 5 minutes per side). 3. 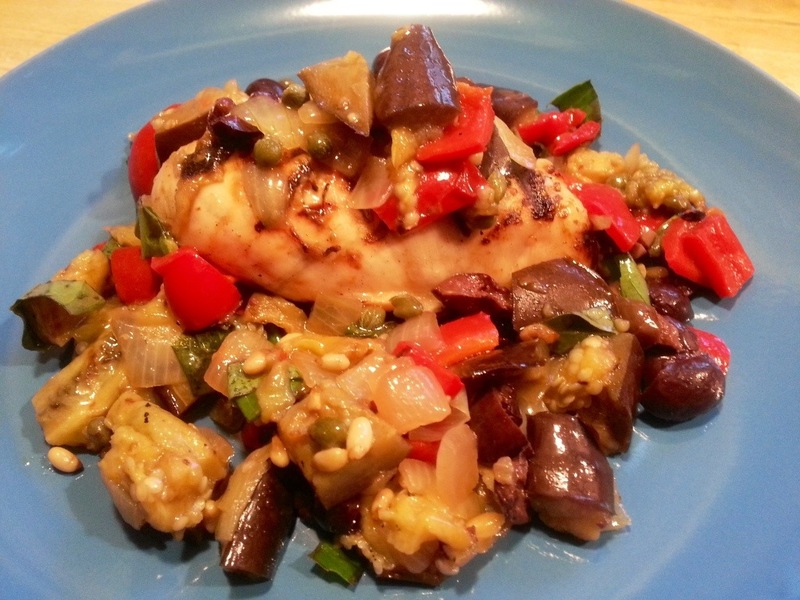 Top each piece of chicken with a mound of caponata (either warmed or cold) and enjoy! Ok, now it’s time to cook him! 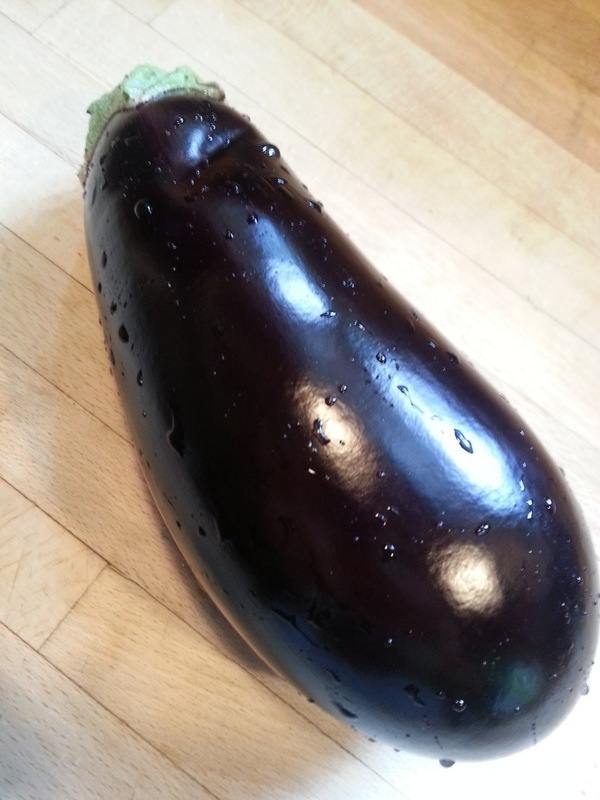 Caponata is a traditional Italian dish, and the very first thing that came to mind when looking to cook this guy. My version is the traditional version with a couple of twists that I hope you like! You can serve it in dip form as an appetizer, or substitute it for bruschetta. I will be topping grilled chicken with it tonight. You can also toss it with some pasta. Use your imagination, and please comment to let me know some of your awesome plans for it! 1. Preheat grill to medium high heat. 2. Trim the ends off eggplant and cut into 1/2 inch slices. Cut pepper in half and remove seeds. Drizzle a little olive oil on veggies, and grill for 5 minutes per side. 3. While eggplant and pepper are grilling, sauté onion and garlic in a drizzle of olive oil over medium heat until onion begins to caramelize. 4. Remove veggies from grill, allow to cool until you can handle them, and slice into 1/2 inch pieces. 5. 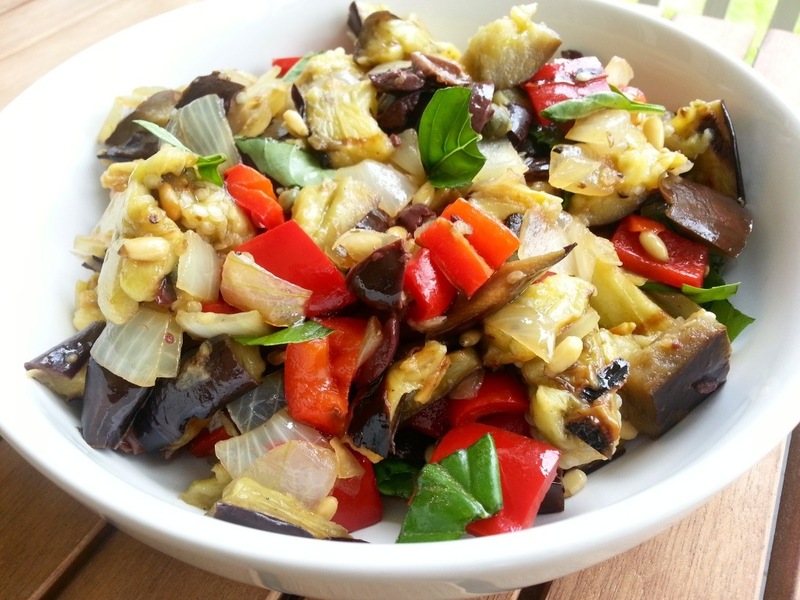 In a large mixing bowl, combine veggies, onions with garlic, olives, pine nuts, capers, basil, vinegar,and olive oil. Careful stir and season to your liking with salt and pepper. 6. Serve warm or refrigerate and serve cold… But please let me know how you serve it! Water is boring. Incredible for your body, but boring. Make a pitcher of this in the morning and you will be surprised how quickly your family devours it! 1. 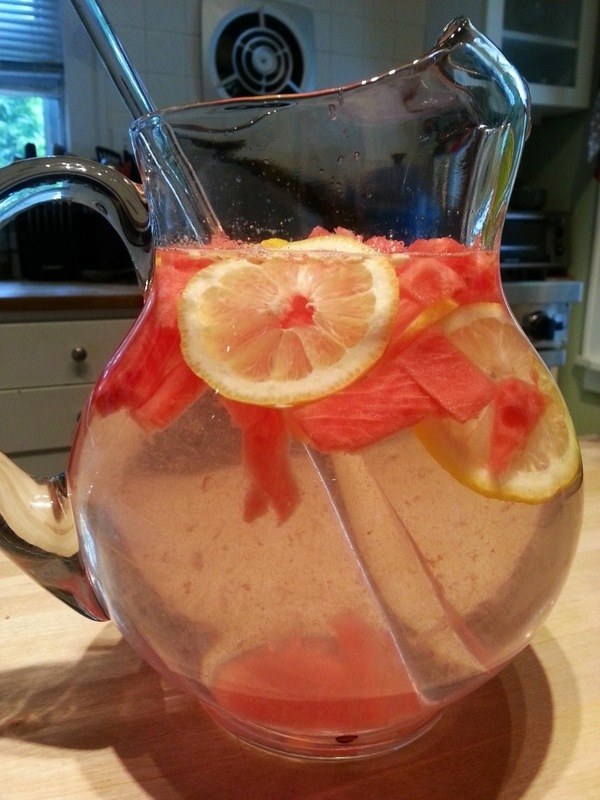 Fill pitcher with fruit, top with water, refrigerate. 2. Hydrate your thirsty body! It is great to come home from a long day and workout to a crockpot of turkey meatballs, but a bowl of balls just doesn’t cut it when looking for a complete dinner. This option keeps the carbs away and is delicious! 1. Preheat your grill to medium high heat. 2. Cut the ends off the zucchini and slice in half lengthwise. Using a spoon, scrape out the seeds and fill the void with sauce and meatballs. 3. Grill for 10 minutes, top with a bit of fresh sauce, and enjoy! The majority of my recipes serve two. This one serves an army. Ok, maybe not an army, but enough to feed our family of 4 and then freeze the rest for a complete second meal at a later date. I love pasta. There is no question that it is my favorite food. Ever. The paleo diet puts quite the damper on my pasta habit, but the flavors of this sauce (or as the Italian in me must say, “gravy”… Since it has meat in it) are incredible. It’s almost enough to fool me into thinking I am eating spaghetti and meatballs! 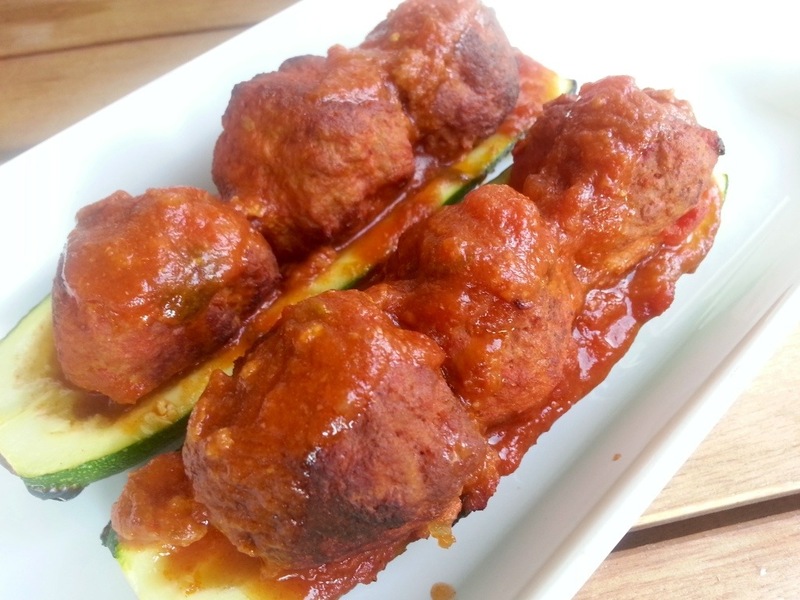 The meatballs can be served as is, over zucchini noodles, on spaghetti squash, or the good old fashioned way – on top of a mountain of spaghetti. Given the summer heat, I have turned this into a crockpot recipe. It allows me to do the “cooking” during the cooler morning hours and not heat up the whole house in the evening. Don’t have a big enough crockpot (you will need a 6.5 quart one)? Feel free to make in a good old fashioned pot and allow it to simmer for at least 3 hours over low heat. 1. In a large skillet over medium high heat, sauté olive oil, onion, garlic, salt, and pepper until fragrant – about 5 minutes. Add tomato paste and wine while stirring. Allow to sauté for 5 more minutes while occasionally stirring. 2. Transfer onion mixture into crockpot. Roughly chop the tomatoes right in the can (I take a sharp knife and give them a few slices to make sure they are at least cut in half. Add tomatoes and sauce to crockpot. Stir in basil and oregano. 3. Remove the turkey sausage from its casing and brown in a large skillet over high heat for about 5 minutes. Drain and transfer to the crockpot. 4. 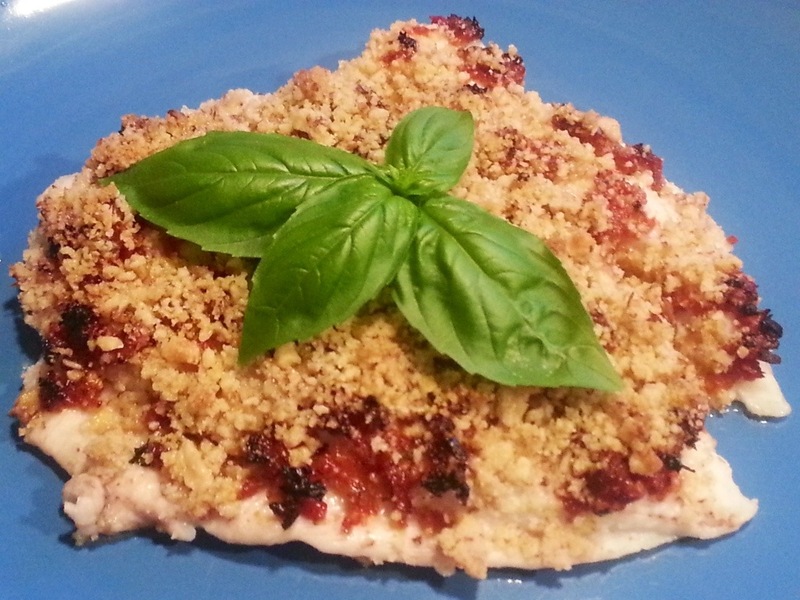 Using your hands, in a large bowl, mix ground turkey, egg, almond flour, garlic powder, salt, and pepper. Make 1 inch meatballs and place to the side. You should get about 30. 5. In two large frying pans (or two batches in one),heat a drizzle of olive oil over medium high heat. Brown all sides of the meatballs while carefully turning for about 10 minutes. The browned crust will allow them to stay together while cooking all day. 6. 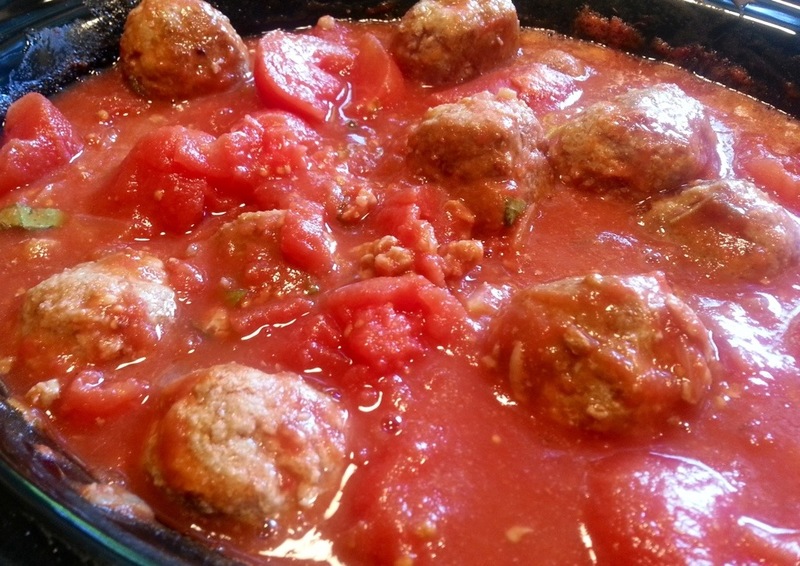 Transfer the meatballs to the crockpot and very carefully stir to coat them with sauce. Set the crockpot to low and allow to cook for 7-9 hours. I usually let the weekly circular decide what is for dinner, so I got excited when I saw that pork tenderloin was on sale. It will allow me to cook outside on this muggy evening and use fresh herbs from my garden. That’s win/win! 2. While grill is heating, mix garlic and herbs in a small bowl. With a paring knife, pierce the pork in about 20 places, 1 inch deep. Stuff each hole with the herb and garlic mixture. 3. Rub the olive oil and lemon juice on the pork and then generously season with salt and pepper. 4. Grill while turning for approximately 20 minutes or until it reaches an interior temperature of 145 degrees Fahrenheit.